Are you celebrating? Well, are you? I am celebrating by finding other celebrants–people I want to add to my tribe because they care about this stuff as much as I do. I have to confess to being a bit of a grammar geek–although not nearly at the level of Mignon Fogarty aka Grammar Girl. I know some things, but I may not know why I know them or the rule behind them. That comes from thirty years of proofreading, following publisher style sheets, painstakingly reading typeset pages and marking pdfs until my eyes blur. 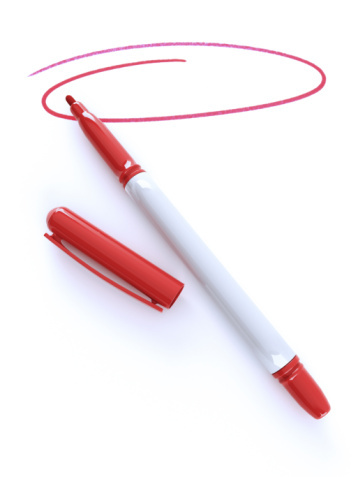 I love my red pen. You see, I value perfection. (Oh my, I sure hope there aren’t any errors in this post when I’m finished . . . ). I’ve started grad school to learn more about teaching writing and discovered in my theory classes, much to my chagrin, that teaching grammar works against creativity and that college instructors try to steer clear in favor of the big picture, the creativity, the thought processes. I believe all of that is vital, of course. What’s the point of writing if you can’t make a clear argument or create a document that flows? But I also believe that the best argument in the world will get ignored if the writing is fraught with errors. Why do I want to take the time to read your article and consider your opinion if you can’t take the time to make sure to spell correctly and use proper punctuation? So I love National Grammar Day. (It’s on March 4th because apparently that’s the only date that forms a sentence, “March forth.”) I love when I find others in my tribe who care as much as I do about grammar and punctuation and a well-written sentence (they won’t be dangling any modifers in front of me, no sir!). A word to the wise: An error-free letter is now so freakin’ rare that the minimal care required to send a letter with zero defects, combined with a few crisply written simple declarative sentences, will, alone, guarantee a respectful reading of a resume. Maybe even secure an interview. Doesn’t anybody read Strunk and White in school any more? If you haven’t, get a copy of The Elements of Style, so you can follow it all your days. Now all those theorists have a point. Do your writing and don’t worry a bit about your grammar. Get your ideas down. Tell your story. Make your point. Do the best writing you can do. But before you send the query letter, turn in that article, or send in that manuscript, do me a favor. Now realize that if you have your own little stylistic “tics” (you want to Capitalize Certain Words for Emphasis, or do random italics), then just let your proofreader know. You can be “incorrect” if it’s part of your style. Create a style sheet that tells your proofreader this is how you want it–then he/she will make sure that you’re consistent, along with looking for any errors you may have missed. As citizens of the literary world, let’s protect our craft, always doing our best to deliver the best quality. And if you feel that your proofreading skills leave something to be desired, hire a professional proofreader (or get someone you trust who really knows the craft) to go over everything before you submit the story or mail the letter. Believe it or not, there are people who thrive on helping your writing be perfect. In fact, even if you are good at it, it’s difficult to proofread your own work. It’s that whole “seeing the forest for the trees” thing. So celebrate National Grammar Day with me! Grammar is the toolbox of our trade. Let’s keep those tools sharp! Excellent post! I didn’t realize that today is Grammar Day! I celebrate it with you, and second the need for putting one’s best foot forward through proofreading and using spell check at least (though spell check does not deal with homophone issues). I read a number of blogs written by literary agents. They always comment on letters they have received in which the correspondent misspelled names (particularly the agent to whom he or she writes) or made other proofreading errors. Refusal to proofread or at least double-check the agent’s name is deemed insulting and therefore usually merits a rejection, even if the manuscript is stellar. True! Getting the name correct is so important. Most of that information is easy to find, so there’s no excuse for getting it wrong! Thanks for checking in! Celebrate! Linda, That’s so true! I really hammer this home with my students–especially the ones in my business writing class (and, of course, in my editing class). They have to brush up on grammar and have a dictionary on hand to look up anything they aren’t 100 percent sure about. There’s just no excuse. And if the person can’t proofread, he/she should find someone who can! With either, or, not, but, or or, the verb agrees with the nearer subject. The “Comma Rule”: When in doubt, leave it out! There, my contribution to Grammar day. By the way, how old is Kelsey these days??? Have a good one! Skip. Hi! You might have me confused with someone else–I don’t have a Kelsey. Thanks for your contribution to Grammar Day! Thanks for the link to our Cover Letters from Hell. I once took the 100 most recent cover letters submitted by job seekers, and counted the number which had zero defects in spelling, grammar, punctuation and usage. I was being strict, even counting things I would normally let slide. So how many out of a hundred passed the test? Care to guess? The actual number of “perfect” letters was … zero. 100 shots, 100 misses. Oh my, that’s sad. I have your link saved and I show it every time I teach my writing for business class when we’re working on their resumes and cover letters. They love it . . . AND it helps me drive home my point. They love it. Hmm, March nineteenth . . . that just might work.